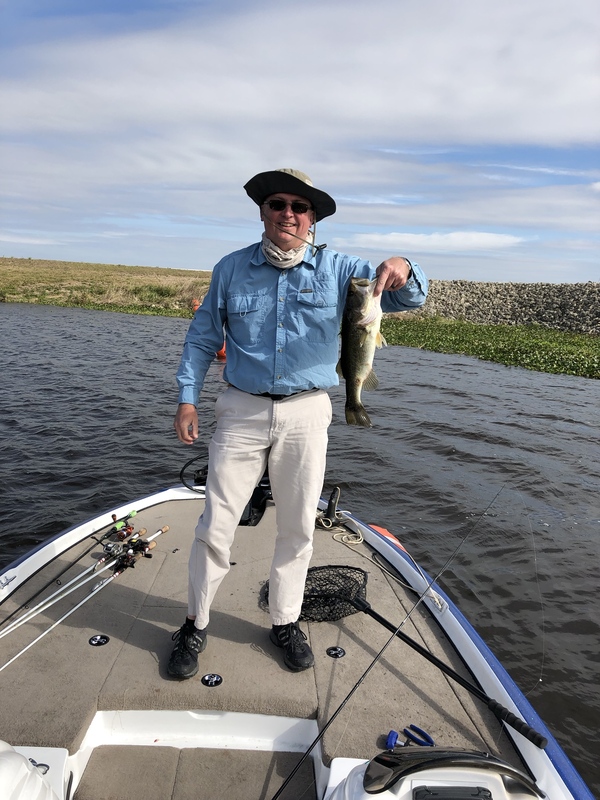 Fishing Lake Okeechobee is on my bucket list and we are finalizing plans to go the end of this month. We plan to hit some other bass lakes on the way down / way back home. Well maybe you will catch that 10 pounder. Hope so, While I have heard of the Okeechobee I have never been anywhere close to it. I had a friend in Florida who went there a lot when he was a kid but when he moved back to northern Florida in his older days he never went again. He said it is a big lake. I looked it up. He was right. Good luck on your trip Sarge. I know the big southern bucket-mouths are fun to catch, but do you eat or just release them? Yeah it's a big lake. FYI if you want some eatin' fish, fish the east side below the gates. You'll know it when you'll see it. We'll catch and release but with a little luck maybe we'll practice C.P.R. - Catch. Photograph. Release. Thanks, Tony. I've seen those gates on pics and maps. We'll check them out. LOL! I'd be dremin of a teener if I was headed there! Bring a long a huge swimbait in case you get bored with smaller ones. Maybe a monster will cream the giant bait! Good luck though! Can't wait to hear how it goes. Thanks guys! I think we have everything finalized. Heading down on Friday. Good luck Mike. My AF friend from Chattanooga has been coming down here every year since 1987. We usually head down late feb. early march. 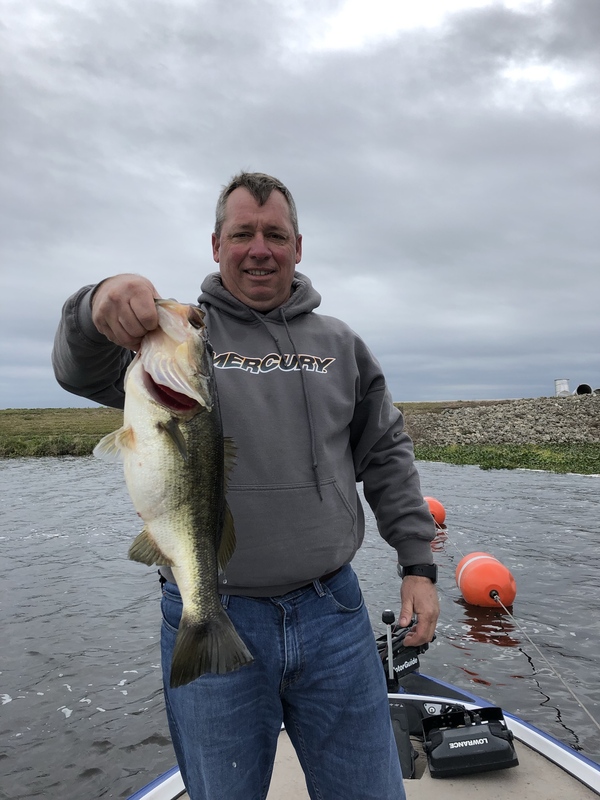 We always have a blast and lots of Big bass caught. I usually go after the Specks/crappie myself, but get a few shinners and catch a few of the Ol"bucket mouth's. If I had time I'd join you. How long are you staying? Heading back Thursday 1/31, Spyder. We plan to fish artificials mostly but I sure want to try a few shiners, too. 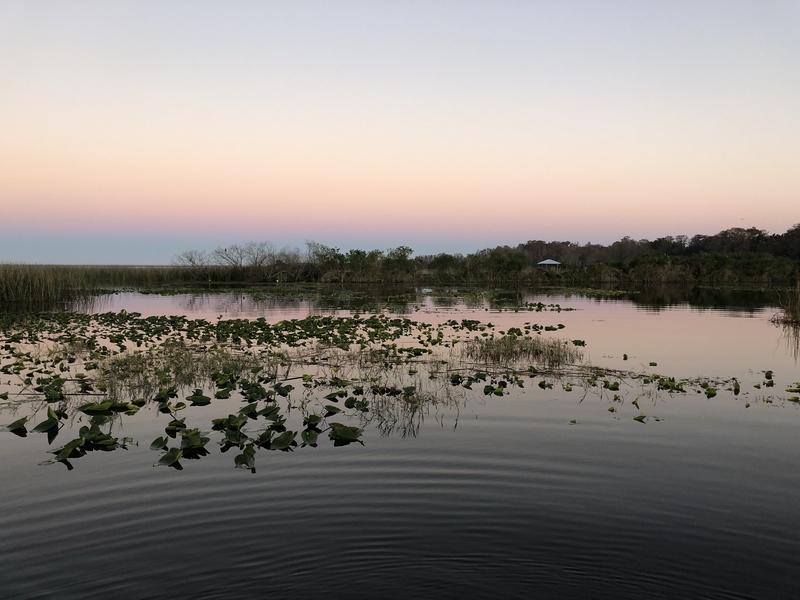 We also want to hit a few of the other lakes - Stick Marsh, Farm 13, Toho, etc. A real hillbilly fishing expedition! We had a great time and made it back home safely but the fishing wasn't great. 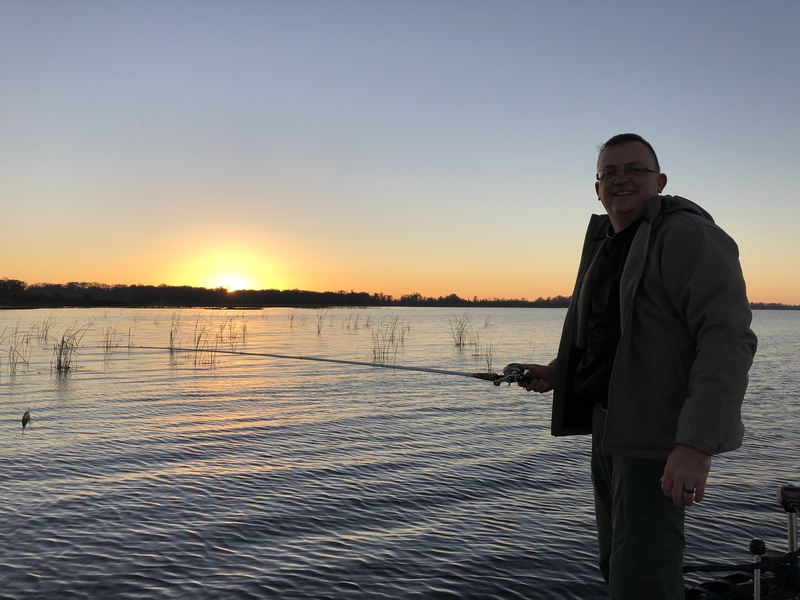 The first day we fished was on Saturday 1/26. We spent a lot more driving about and exploring that we spent fishing. My friend caught a couple - I caught nothing that day. Forecast called for 2-4" that day but it wasn't that bad. It rained on and off all day and we fished all day. We stayed in the canals on the north end of the lake around J & S Fish Camp, Henry Creek, etc. Caught a few that day, all around 2 pounds. Others we talked to in passing said they caught nothing that day. Monday, the rain moved out but it was cloudy and very windy most of the day. We went down to the South Bay area that morning and didn't get a bite. Some of the guys down there pre-fishing for the Costa FLW said the same. 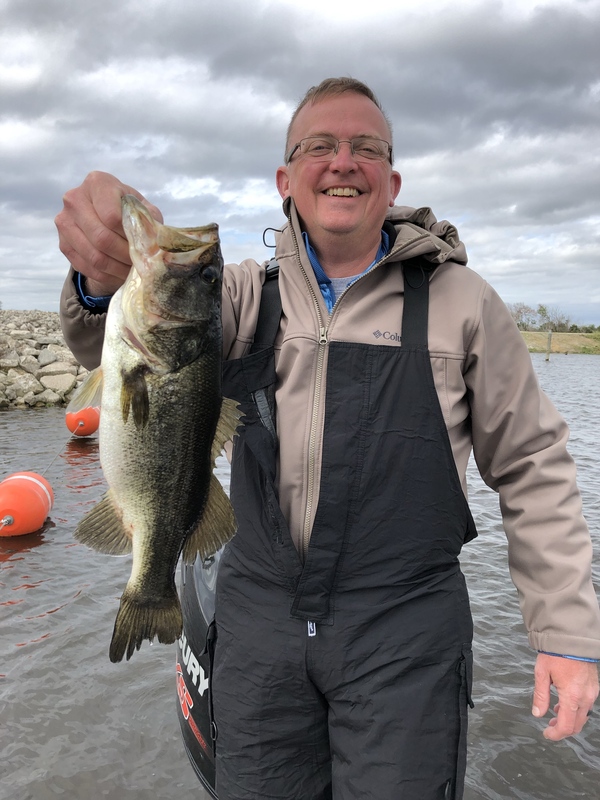 One local told us the water temps were around 65 a couple weeks ago but the cold snap cooled the water to the mid-upper 50's and the fish had lockjaw. Also, he said the water level was down about 3 feet and many places the normally hold fish were dry, in a few inches of water, or were inaccessible by boat. Mid-day, we went back up to the J & S area but no luck there. Late afternoon, we went to the Taylor Creek ramp on the north end of the lake. Winds calmed and the sun popped out for a bit. 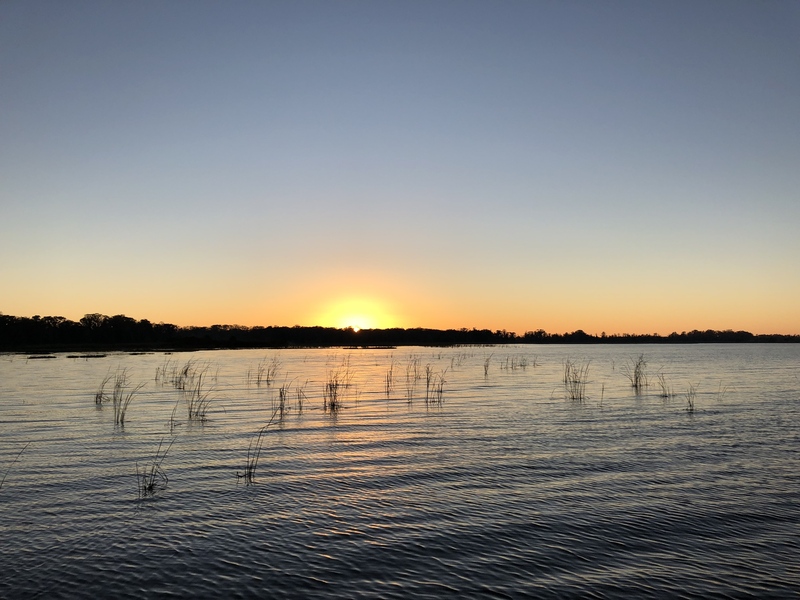 Just about sunset, I hooked a big bass on a Rapala clacking crank in a foot or two of water. He came off at the boat. My buddy had the net and got a closer look at it that i did. He swears it was a 10 pounder. I'd guess it more like 7 or 8... Anyway, ZERO fish in the boat on Monday but a nice sunset. Tuesday, we drove about an hour north up to Istokpoga and got on the water about sunrise. Beautiful lake and met some really friendly folks there! 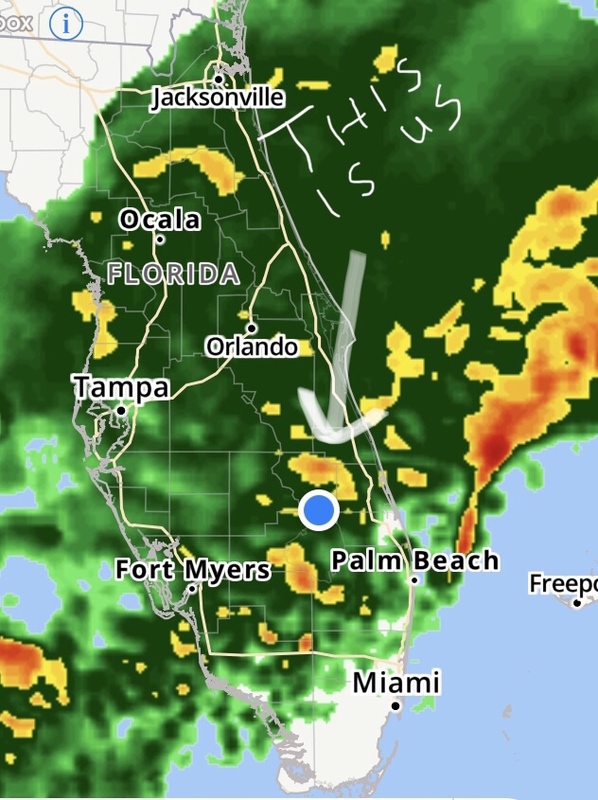 Heard the same thing about the water temps as we'd heard at Okeechobee. Surface temps had been about 65 a couple weeks ago and had dropped 8 or 10 degrees. Several residents there said no one was catching bass right now. Just our luck. 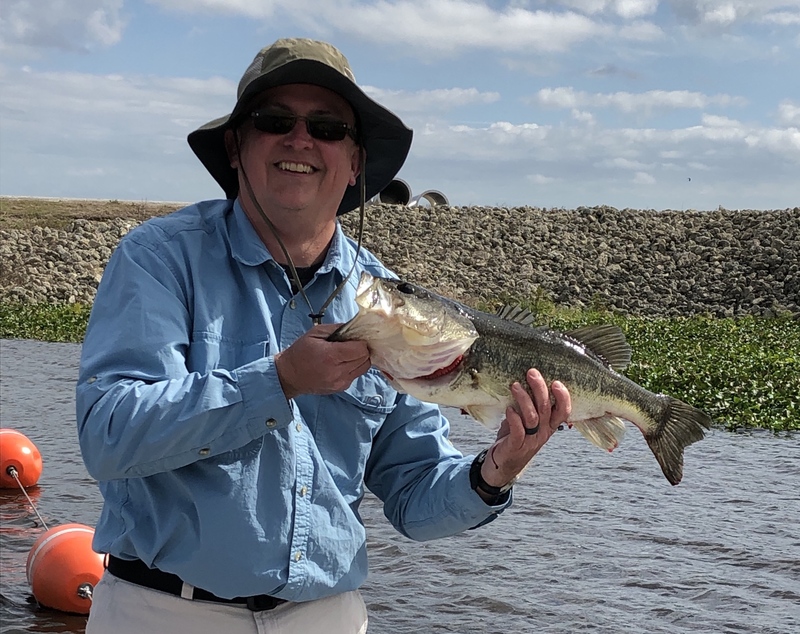 My friend caught 1 on topwater in a canal but a homeowner came out and said he had just fed the fish there. We joked about catching the guy's pet bass. I caught nothing there. We trailered up after lunchtime and went back toward Okeechobee. We fished canals again late afternoon until dark. We each caught one at the same place, about the same time. At least I caught one that day. Haha. 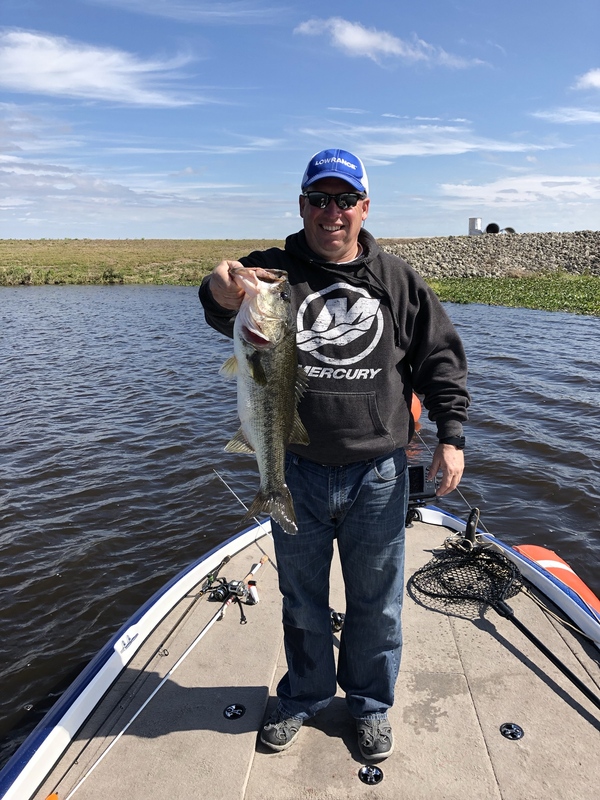 We went to Stick Marsh on Wednesday, bought shiners, and got on the water about 11 am. Finally, we caught a few here. We also lost several by pulling the bait away too soon. 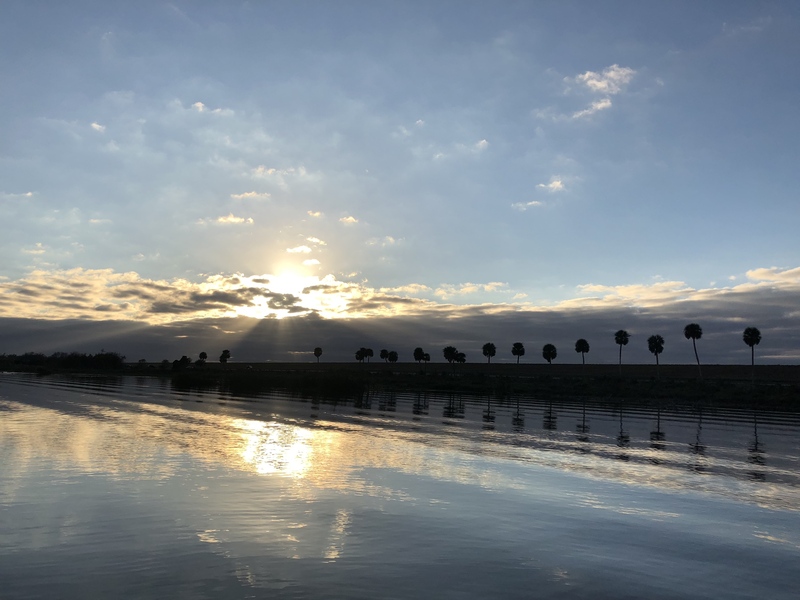 Went back to Stick Marsh on Thursday and got on the water about sunrise. Not as many bites as the day before but we still boated a few and lost a few. We each caught one of these and I'm sure they wrecked our rigs a couple times ... not sure what there are but they were angry, angry fish. We trailered up about 1 pm and headed north, stopped for dinner in Jacksonville, then drove overnight back to Knoxville. No trophies but a good trip and some good times. Gotta love fishin'. Bigin's or not. Nice photos Mike. Those bass look pretty good to me, a couple of them are really nice. I would like to know what that long fish is too. 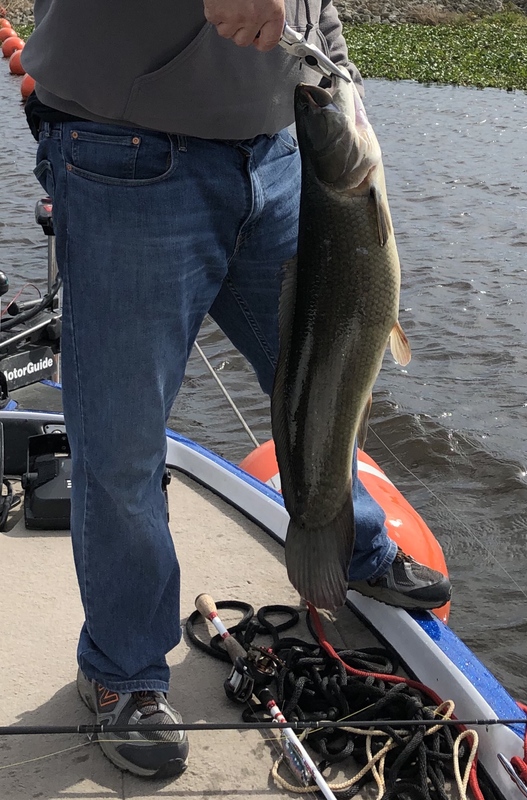 I'm guessin' it's a bowfin. Thanks Wolfy, sure appears to be one. ?They have a nasty disposition, a face full of teeth and a penchant for ruining fishing lures. What more could you want?? Looks like a fun trip, thanks for sharing. So does mine...it changes the ''s to ??s. On the iPhone, there doesn't seem to be any way to change them back to apostrophes or quotes, so I have to go to the iPad to change them back. It will do the same thing when I copy & paste a citation from another source. Aggravating! Looks like a good trip. 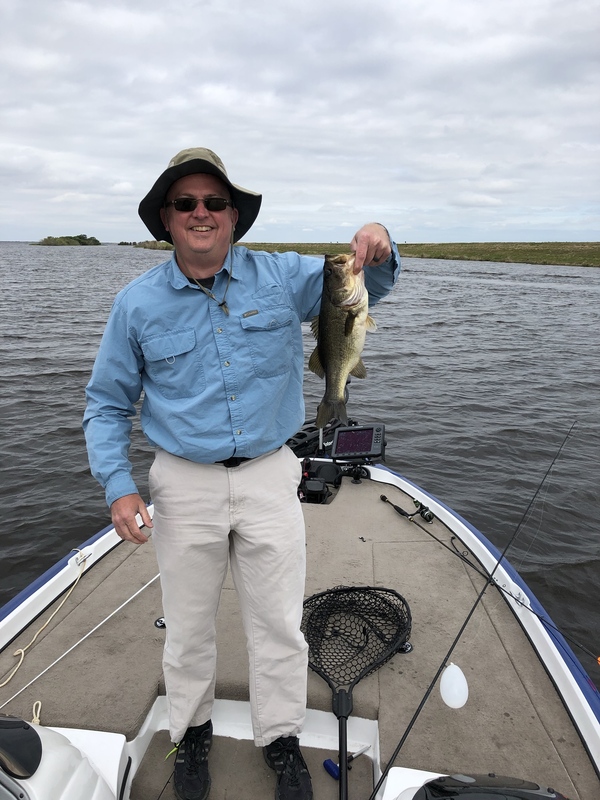 I suppose the weather could've been a little more cooperative, but at least you caught some good looking, nice sized bass and those bowfins are at least fun to catch! Fun trip for sure. That lake is a bucket list trip for most bass anglers. glad you caught some. I would have guessed that last fish was a snakehead.